Valuable information on counter-piracy operations and coordination of assets off Somalia and the Gulf of Aden, was recently exchanged during a cross-deck by Task Force Commanders in flagship TCG Gemlik on 13 Oct. 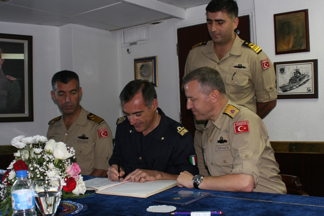 Commander Combined Task Force (CTF)151 Rear Admiral (RDML) Oguz Karaman of the Turkish Navy hosted EUNAVFOR Commander RDML Enrico Credendino from the Italian Navy and two officers from the their flagship ITS San Giusto, Commanders Giuseppe Aletta and Luc De Maesschalck. RDML Karaman said the meeting with his EUNAVFOR counterpart reinforced the unity of mission and focus for both Task Forces, and highlighted the strength of having multiple assets covering a far greater area of operation. He noted the significance of this rare exchange of information as the operational tempo often precludes such events. “We both have incredibly busy task forces who share common goals in the counter-piracy mission at sea and with such a vast area that we patrol, it is not always feasible for us to meet in person,” RDML Karaman said. The visiting officers provided key information directly to the CTF 151 operators about the San Giusto’s successful thwarting and apprehension of a piracy action group a few days earlier. RDML Credendino echoed CCTF 151, highlighting the importance in their partnership with Combined Maritime Forces (CMF) as part of the comprehensive approach to deterring pirates in the maritime domain.